PHILADELPHIA, PA – September 5, 2017– Janney Montgomery Scott LLC (“Janney”), a leading full-service wealth management, financial services, and investment banking firm headquartered in Philadelphia, PA, announced that The MacPherson Gilchrest Group, led by Christopher R. MacPherson, Executive Vice President/ Wealth Management, and Evan T. Gilchrest, Executive Vice President/ Wealth Management, have joined the Glastonbury, CT office. 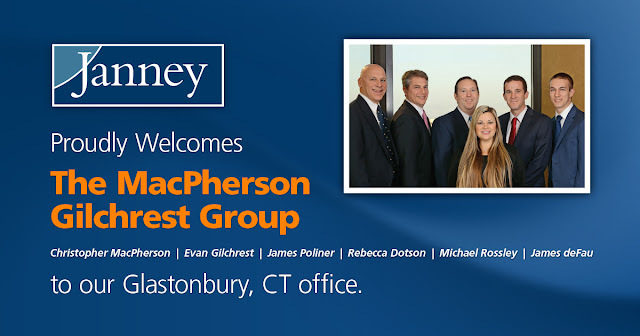 The MacPherson Gilchrest Group was previously affiliated with Merrill Lynch. 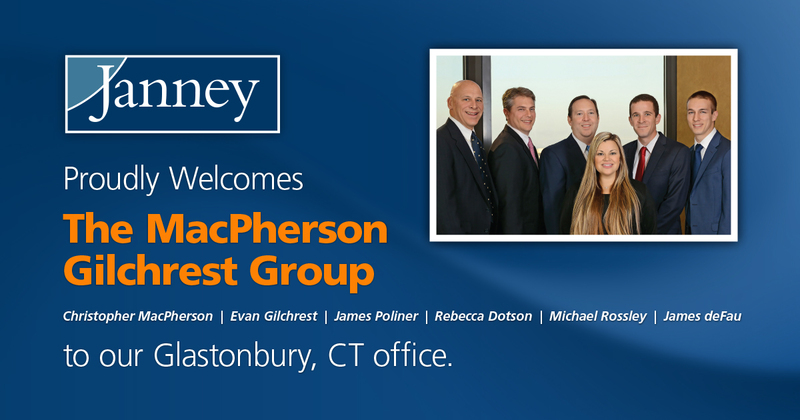 MacPherson and Gilchrest are joined at Janney by James M. Poliner, Rebecca Dotson, Michael Rossley, and James deFau. MacPherson earned a bachelor’s degree in business administration and finance from the University of Connecticut, and he holds the designation of Chartered Retirement Planning CounselorSM. Gilchrest, a Certified Financial PlannerTM, graduated from the University of Connecticut and was recently named one America’s Top Next-Generation Wealth Managers by Forbes. Janney’s Glastonbury, CT branch office is located at 180 Glastonbury Boulevard, Suite 302, Glastonbury, CT 06033.